Happy Sunday! Today was a beautiful day! Praising God in the morning and crafting in the afternoon! How much better can it get?? Today's card is a birthday card for our oldest granddaughter, Nevaeh that is turning 8 this week. It's an unusual birthday card because Nevaeh has received her "dream present" for her birthday. She finally received a bunny. She's been asking her Mom and Dad for one for a couple of years now. She got it early (just a few days ago) and is absolutely thrilled! That is all she can talk about and the only thing she wants from us are bunny supplies! Did you know that they sell bunny harnesses? I bought her one today so she can walk Almond, Yes Almond is her bunny's name! 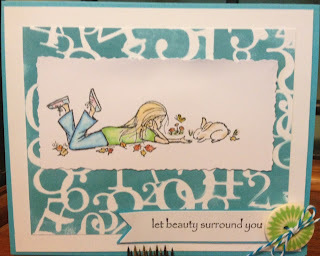 Ok, so I really didn't think that a "Happy Birthday" sentiment would look right on the front of this card so I went with the "let beauty surround you" sentiment that came with the set. So instead of using a regular background DP, I made the background by stenciling a number collage on white cardstock using Tim Holtz Distress Ink. Oh and the super cool thing is that I just bought the number collage template on clearance at Hobby Lobby for $2.99. I love a bargain!!! Ok, so then I stamped the Happy Birthday Sentiment on the Inside. This is definitely not my typical birthday card but I think considering the circumstances, she and Almond will love it! 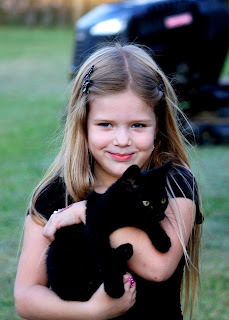 Here's a picture of Nevaeh..
Have a wonderful week and remember to Let Beauty Surround You! She is going to love it, Tina!! 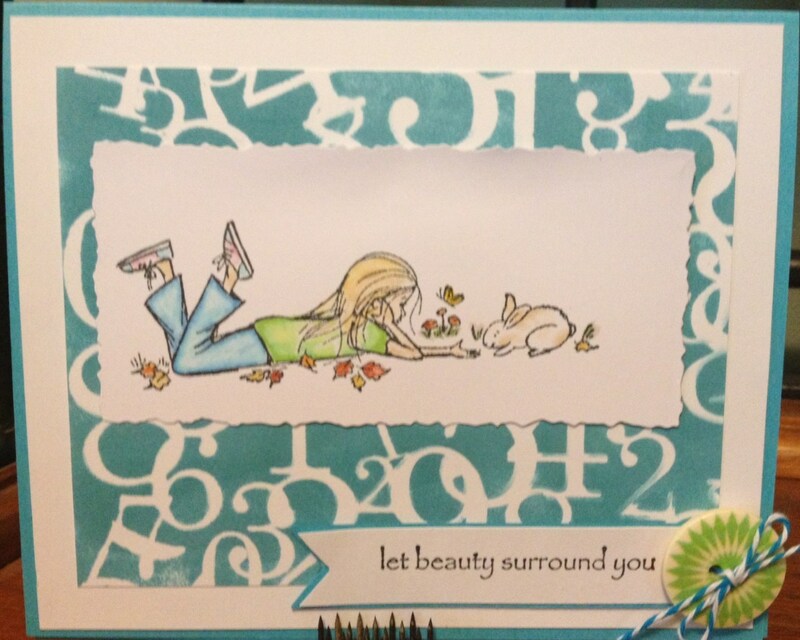 It's wonderful that you were able to come up with such a cute & memorable birthday card for her to go with her gift!! Not an easy task !! Great card! I love the image, and the sentiment you chose is one of my favorites! Thanks so much for sharing this wonderful project with us here at 613 Avenue Create. Thanks so much Chana and thanks for stopping by! Love the background, Tina! Fabulous and so creative. Thanks for playing along at 613 Avenue Create this week. Great card, loving the background. Thanks for visiting us at 613 Avenue Create.